I first saw a little wooden clothespin doll at a friend’s house long ago. It was cute, durable for play, and something I could make at home. I got my brother Peter to help me create one for myself and I named her Penny. 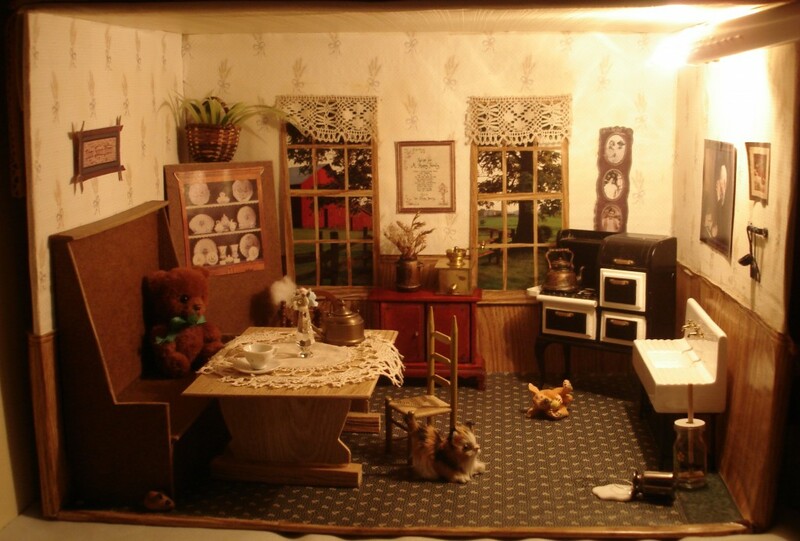 I used to stack cardboard boxes to design dollhouses in play. Now I began building a deluxe cardboard box room for Penny. 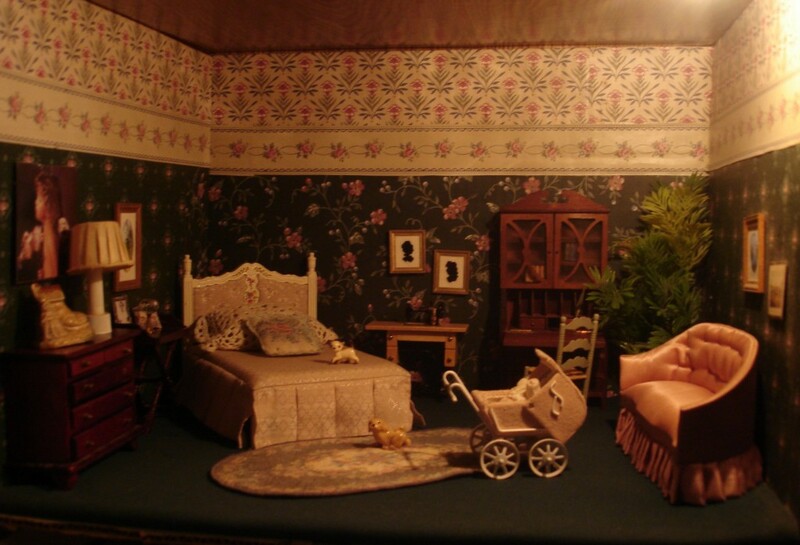 With wallpaper scraps, I covered the walls and ceiling and chose a fuzzy fabric for the carpet. I found a pleasant outdoor scene in a magazine and cut it to shape two window views. 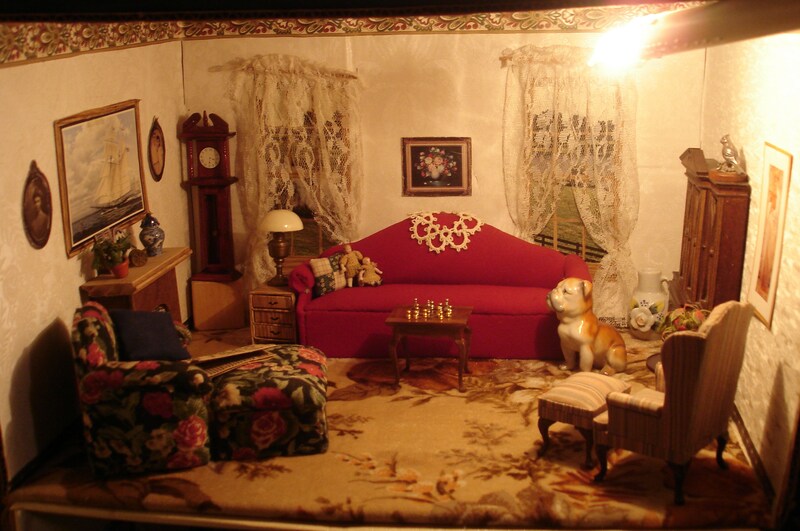 I glued over them some lace curtains and built a little fireplace from scrapwood. My friend, Tricia, taught me how to make the red couch and cushy flowered chair and ottoman (just like one I’d like to lounge in) using cardboard, batting and fabric pieces glued together with a hot glue gun. I cut pictures in frames from magazine pages to decorate the walls. I was so pleased with the results that I built two more rooms that completed Penny’s house, a kitchen, and a bedroom on top. I enjoyed making or hunting up furniture to make it truly “Home Sweet Home”. 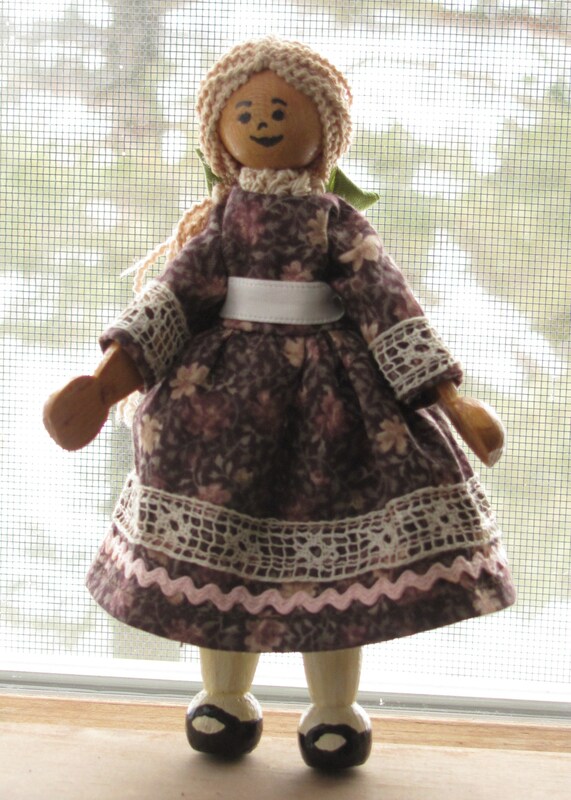 I believe I first got the idea to make Penny a traveling doll from Louisa May Alcott’s story The Doll’s Journey, where two dolls are sent through the mail to visit Aunt Maria in Maine, and there follows a whole string of mishaps and adventures. Unfortunately, I would never be able to see what Penny sees in her travels, but I could collect pictures of her in the places that she visits, and create a scrapbook to treasure. I imagined sending her to the homes of friends in far away states; it would be almost like visiting them myself! But I was completely blown away by her first opportunity. My friend Andrea sat there in our living room calmly saying that she would be heading to Australia to visit her relatives there. What?? You have relatives that live in Australia? Like, on the other side of the World?? Unbelievable! 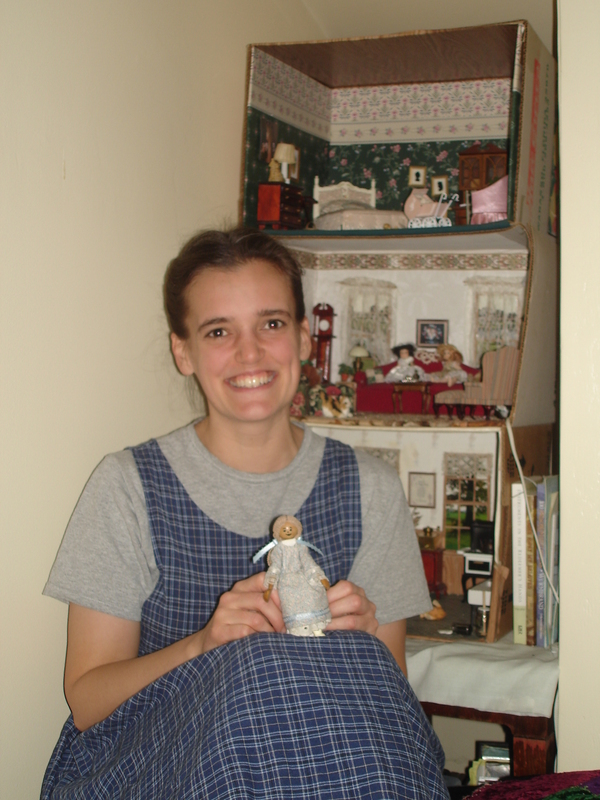 I mustered up the courage to ask Andrea if she would be willing to take along my doll, and bring back pictures of her there. I thought she would think it silly, but she agreed happily! And so, a little bit of me traveled with her to the other side of the world. And from then on, her adventures have multiplied. And I still haven’t caught up with all the scrapbooking!! 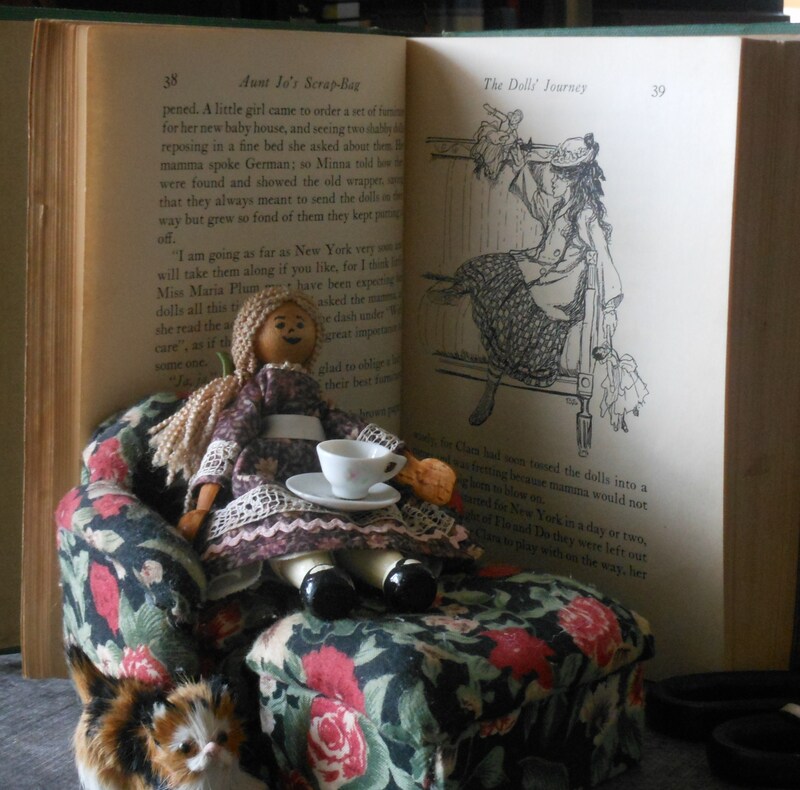 see Penny Visits the Land Down Under to see the scrapbook pages of Penny’s trip to Australia. see Penny’s Cousins Begun to see how the Penny doll idea is expanding into a ministry. Beautiful pictures. I am enjoying your website.